It is not Thanksgiving without pumpkin pie. A few years ago, when my son was a student at Vanderbilt, I asked him if he wanted to invite friends over from school who couldn’t get home for Thanksgiving. About ten friends joined us. He asked me if his friends needed to bring any food. I told him we had the meal covered, but if anyone enjoyed holiday cooking and wanted to bring something, they should feel welcome to do so. A few days later, he sent me an email with the final head count and told me his friends would bring all the desserts. Wonderful. As I scrolled through the email thread, I noticed a letter he had written to his friends earlier in the week. It said, “My mother said if it’s part of your wellness to cook during the holidays, feel free to bring a dessert, otherwise just bring yourselves.” Part of your wellness, how nicely put. Cooking is part of MY wellness. I like that. On Thanksgiving day, everyone arrived, and the desserts were dropped off in the kitchen. Everyone brought their favorite desserts — coconut cake, brownies, chocolate chip cookies. There was no pumpkin pie. So now we get to the point of the story. 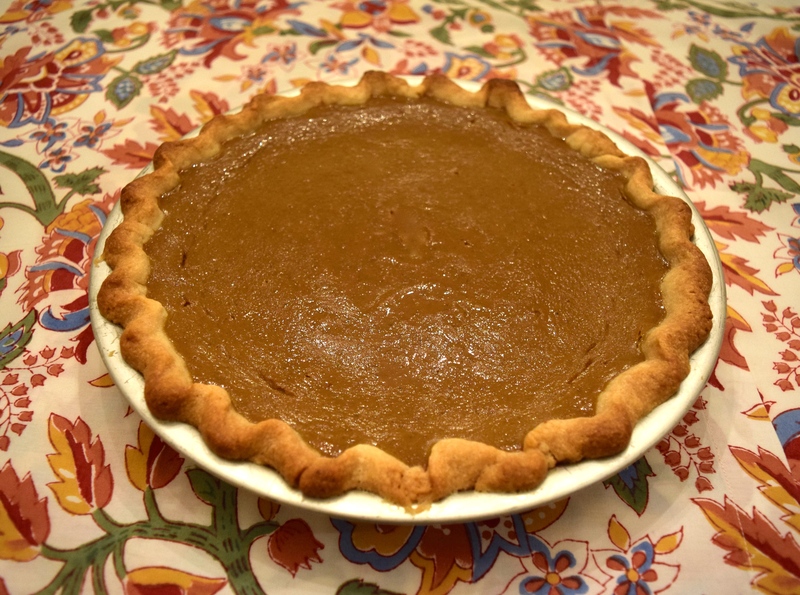 My mother’s recipe for pumpkin pie is so easy to make, I was able to prep it, with the ingredients I had on hand, in the amount of time it took the oven to preheat. The pie cooked while we ate dinner. No one was the wiser. Like for many of you, a lot of my favorite recipes have been passed down to me by my mother, my grandmother and others in my extended family. Thanksgiving is the time to share those recipes. Yield: Makes one 10-inch pie, or one 9-inch deep-dish pie. 2) Prepare pie crust. If you are using a 10-inch pie pan, you may need to roll the crust a little more to stretch it and make it fit. I like to use Trader Joe’s Pie Crusts. Once the crust comes to room temperature, which takes about 90 minutes, unroll it retaining the plastic sheets as you do. You’ll find that the dough breaks up into wide strips as you unroll it. Not a problem, just use a rolling pin to rejoin the cracks while the dough is still sandwiched between the plastic sheets. Next, remove the plastic covering from one side of the crust. Using the corners of the remaining plastic square, lift the crust, turn it over, and plop it into the pie plate. Continue to leave the plastic on the dough as you then press the pie crust into the pie plate. Remove the top layer of plastic. Fold edges in and crimp to make pretty. 3) Prepare Filling: Blend all the ingredients together in a mixing bowl for about 1 minute on medium-low speed. 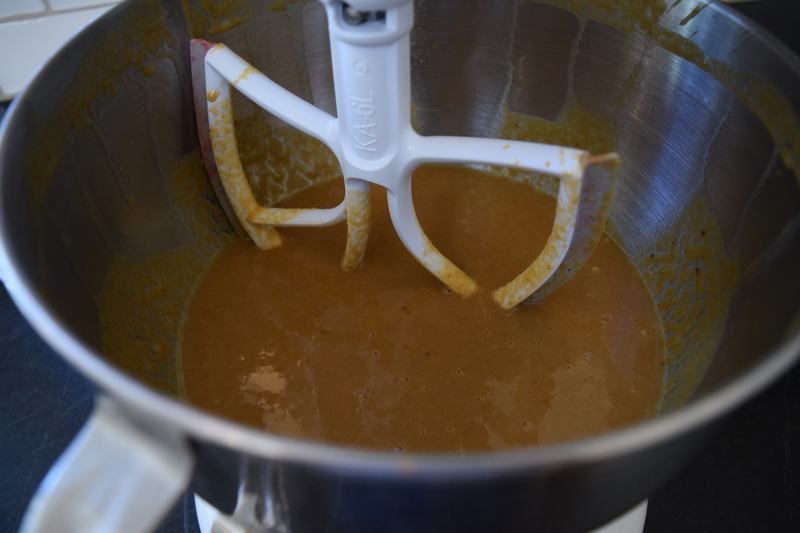 Be sure to scrape the batter that settles into the base of the mixing bowl with a spatula and then mix the batter for a few more seconds after doing so. Pour the filling into the prepared pie crust. 4) Bake for 10 minutes at 450º. Turn the oven down to 350º and cook for 45 minutes more. To check for doneness, prick the center of the pie with the tip of a knife. It should come out clean. If not, let it cook for five more minutes and test again. If you are using a deep-dish pie pan, you may need to cook for an additional 10 minutes because of the added thickness of the filling. 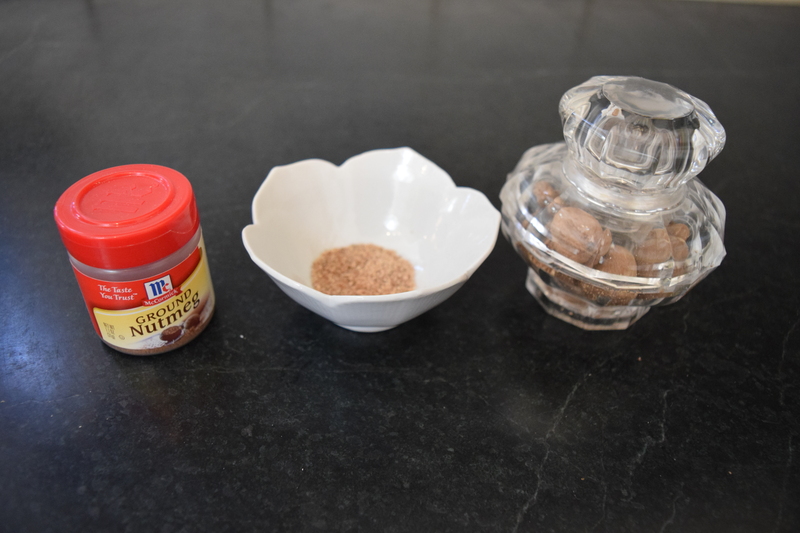 About Nutmeg: I grind my own because it is so much more fragrant. You can buy nutmeg grinders online. Ground nutmeg from a jar works just as well. This pie is delicious served warm from the oven or cold from the refrigerator. It is great with fresh whipped cream on top. My friend, Renée, skips the pie crust all together and pours the pumpkin batter into small ramekins for individual-serving, pumpkin custard desserts. To have recipes delivered right to your inbox sign up to become a follower! © 2014 Judy Wright. All rights reserved. Photos and text may only be used with written consent. At the risk of committing heresy, is it permissible (begging only you and Mme.Byrn) to use sweet potatoes since I don’t like pumpkins? Mea culpa ! Mea culpa ! Mea culpa ! Great story. Warm hospitality rewarded with a plethora of desserts, and good memories I’m sure. Hi, wish I’d seen this before I purchased one from the local store! Looks fantastic! Since Louis was at the house for Thanksgiving it would have been nice to have made this for him to have a family recipe! Thank you! I will definitely make this soon for a football Sunday!